Teaching hygiene to your kids may seem like a losing battle, but here are ways to deal with the worst offenders. Sigh…sound familiar? Indeed, teaching your newly independent early school ager proper hygiene habits is a bit challenging, yet critical from a health perspective. “There are several issues here and one is transmission of infectious diseases,” says Dr. Michelle Ponti, a pediatrician in London, Ont., and member of the Canadian Pediatric Society’s public education committee. “So the risk is to children themselves as well as a risk to those around them. And on top of that there’s the whole idea of what is socially acceptable behaviour.” But from nose picking to avoiding hand washing, these bad habits can require a lot of tedious teaching at home, school and daycare to successfully eradicate them. Check out our tips for tackling six of the dirtiest. Germ patrol: Common flu and cold viruses linger inside noses and spread primarily via nasal-finger contact, but recent research has also found that more serious bacteria such as staph, can also be tucked away deep into noses. Side effects: Colds, flu and even staphylococcus infections. How do I fix it? Avoid shaming your child for doing this because that’s when the habit can turn secretive. “Sometimes children don’t even know they’re doing it. I often see children sitting with dripping noses and they aren’t even aware,” says Carolyn Taylor, a kindergarten teacher in Georgetown, Ont. Carolyn opts to redirect children, so she reminds them to take their fingers out, get a tissue and then wash their hands. Vigilance and consistency are key in squashing this habit so it helps to keep boxes of tissue stashed around the room at the children’s level so there’s no excuse not to use one, says Wendy Marshall, owner of Pumpkin Patch Daycare in Bolton, Ont., and president of the Association of Daycare Operators of Ontario. “Children learn that they have to wash their hands after they’ve done these things so they finally get to know that that’s something that requires a hand wash to stay healthy,” Wendy adds. Germ patrol: Bacteria-laden plaque can build up on a child’s teeth if brushing and flossing are not done well. Side effects: At its worst, plaque build-up can cause cavities and gingivitis. How do I fix it? “Personal hygiene habits start with modelling by the parents,” says Penny Morka, a Winnipeg-based early years consultant. So getting a proper brushing might be as simple as doing it together in the bathroom. That way you can control how long the brushing will happen (dentists suggests teeth should be brushed for two minutes per session) or even make it fun once in awhile and let your child brush your teeth. Visual stimulation and positive reinforcement work well here, too. Create a chart where children get a check mark every time they brush and try to floss their teeth (let your child take a crack at it first and you follow by finishing the job) and offer rewards for regular intervals. Also, employ the many tools available on pharmacy shelves these days: light up or singing toothbrushes, colour-your-own toothbrushes and plastic-mounted flossers, which make it easier for kids to clean between their teeth. Germ patrol: Anytime feces is left behind, it can contain viruses and bacteria including rotavirus, norovirus, salmonella and others. Side effects: Touching feces exposes children to a host of illnesses ranging from fl u and stomach fl u to hand, foot and mouth disease. How do I fix it? Are you finding, um, evidence of improper wiping after a bowel movement in your child’s underwear? It is amazing how some children like a squeaky clean bottom while others take a quick pass with toilet paper after the bathroom and aren’t bothered at all by what they’ve left behind. First, start with the basics: remind your child to wipe from front to back. Keep reminding them of this and also eyeball how much toilet paper they use. The over-sized wad they’re repeatedly rolling out may not be doing much. “In general, we assist with this,” says Wendy. “Right from the early age, we give them the toilet paper and encourage them to do it themselves. And if there needs to be a little assistance, the teacher does help afterwards. We also encourage kids to take their time at this job because if they’re rushed, they don’t do it well.” If your child is struggling with wiping, think about stashing a package of flushable wet wipes on the back of the toilet to finish the job. Germ patrol: Once again, the concern is around cold and flu viruses primarily – sneezing or coughing out loud is the great escape for them. Other bacteria that can spread include pertussis and even some of the herpes family of viruses (though not the ones causing cold sores or genital infections). Side effects: Colds, flu, staph infections, whooping cough, roseola and more. 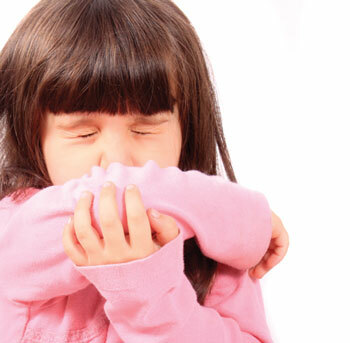 Germ patrol: Flu and cold viruses are the culprits here – but they’re not the only ones. Other viruses can include salmonella, campylobacter, MRSA and giardia. Side effects: As Alberta Health notes, 80 percent of common infections are spread via our hands and this leaves children vulnerable to a host of illnesses ranging from the milder colds and fl u to the more serious giardia-induced diarrhea, salmonella, impetigo and more. How do I fix it? Catch your child running out of the bathroom again with nary a drop of water touching their fingers? “We can’t stress good hand hygiene enough. It’s one of the easy ways to implement keeping ourselves risk-free or lowering our risk of disease transmission,” says Dr. Ponti. After all, a range of viruses can be carried via hands, ranging from the common cold virus to more serious ones. Food allergens can also be transferred from one person to another. Germ patrol: Skin picking can lead to open wounds, which open the door to a wide variety of viruses and bacteria such as staphylococcus aureus bacteria and impetigo. Side effects: Open wounds leave kids vulnerable to a host of infections, depending on where they are and what they’re exposed to. At the least they could pick up warts, at worst, staph infections and more. If the habit is particularly bad, try keeping your child’s hands busy with a fidget toy so they have something to play with other than loose pieces of skin and nails. Astrid Van Den Broek is a Toronto-based freelance writer. mother of two and frequent contributor to ParentsCanada. Originally published in ParentsCanada magazine, February/March 2016. When it comes to germs, keep'em to yourself!